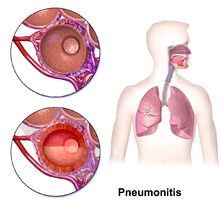 Pneumonitis or pulmonitis is an inflammation of lung tissue. Many factors can cause pneumonitis, including breathing in animal dander, aspiration (inhaling small food particles or vomit "down the wrong pipe"), and receiving radiation therapy to the chest. Viral infection. Measles can cause severe pneumonitis, and ribavirin has been proposed as a possible treatment. CMV is another cause. 1 2 Stedman's medical dictionary. (28th ed.). Philadelphia: Lippincott Williams & Wilkins. 2006. ISBN 978-0-7817-6450-6.